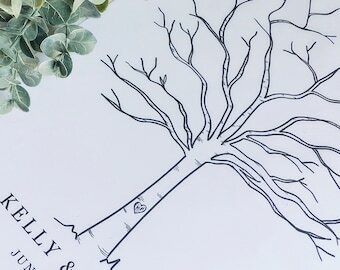 Nothing is more special than having a unique alternative to traditional guest books for your wedding or other special event! 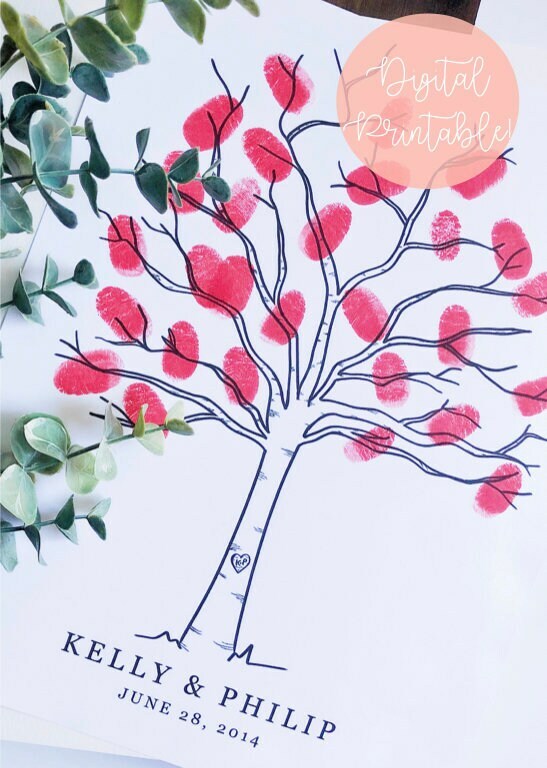 This hand-drawn fingerprint tree is the perfect addition and makes for a keepsake that will be treasured forever! Your guests are encouraged to "leaf" their fingerprint and small signature to create the effect of a full tree. Ditch those other guest books that will just be kept in a dark recess of a bookshelf or storage box, and opt for something you can hang in your home and enjoy for years to come! + Each print is hand-drawn by me then digitized for optimal quality when printing. + This print size is perfect for about 15-30 fingerprints and signatures when printed on 8.5 x 11 paper. This file includes a PDF and image file - no physical print will be mailed to you. Once your payment clears you'll have access to your instant download. + Simply print your tree from the PDF or image file and directly write your custom text. ** Make sure that your PDF reader is up to date as to print without any blurriness. + Use a photo editing program to overlay a text box and write your own custom text. Then, print. WANT A PHYSICAL CUSTOM PRINT? Be sure to check out my listing for this fingerprint tree design where I handle all of the customization for you! You will be mailed a physical print just in time for your special day or event. Don't worry, I respect your privacy and would never fill your inbox with spam! Join our monthly newsletter mailing list to stay in-the-know about new products, sales, and events going on here at the shop! Plus, enjoy an instant 10% off coupon just as a thank you from me!